Chilli rating - medium - 2. Suitable for vegetarians and vegans.A light, fragrant curry native to Thailand. The secret to great Thai curries is the freshness and balance of Thai ingredients that are ground into paste. 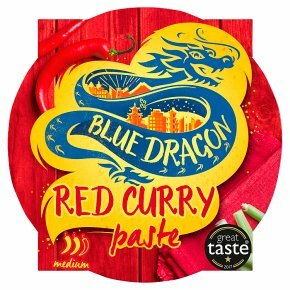 At Blue Dragon, we grind our paste in Thailand to capture all the rich flavours, including galangal, lemongrass, garlic and shallots. We love it served with steamed rice, chopped coriander and Blue Dragon Fish Sauce to taste. Feeling inspired? We love to personalise our Thai curries with these handy tips: Add 50ml water at the end of cooking for a more authentic Thai consistency. Add a teaspoon of palm or caster sugar to finish with a balanced flavour. Add finely chopped red chillies or fresh coriander to dress the curry before serving. Cook for longer to separate the oils for an authentic look.